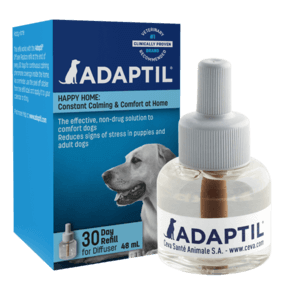 Use ADAPTIL Calm Refill every month to continue to help your dog to calm and adapt at home, in situations like staying alone, loud noises, visitors and fears. Brings you and your dog closer, by creating a reassuring environment at home. Continuous effect, provides constant comfort for your dog. ADAPTIL Calm Refill requires ADAPTIL Calm Home Diffuser.